The Featured Document Blog places the past in your grasp by introducing a compelling item from our digital collection. 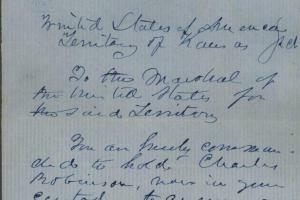 This warrant from May 24, 1856, instructed the marshal of the United States for Kansas Territory: "You are hereby commanded to hold Charles Robinson, now in your custody, to answer an indictment ... In the crime of High Treason." Robinson, a staunch Free-State advocate, was accused of "resisting enforcement of the Territorial laws," in part by claiming to be the legitimate governor of the territory of Kansas and rejecting the proslavery "Bogus Legislature" that had been established in a deeply controversial election on March 30, 1855. Robinson's arrest at Lexington, Missouri, came at the onset of the worst period of violence in the "Bleeding Kansas" conflict, underscoring the deep divide between the Free-State and proslavery state factions along the Missouri-Kansas border. From Robinson's first arrival in Kansas Territory, he advocated for abolitionism and Kansas's entry into the Union as a free state. He served as an agent for the New England Emigrant Aid Company, an organization that promoted migration to Kansas by abolitionists and other Northerners who could promote the antislavery cause. Opposing them were proslavery settlers from the South and some residents of the slave state of Missouri. In the March 1855 election, thousands of Missourians led by former-Senator David Rice Atchison poured over the Missouri-Kansas border to stuff ballot boxes and intimidate local voters. The town of Leavenworth, to name one example, recorded five times more votes than its entire population. The resulting proslavery government moved the territorial capital to the proslavery settlement of Lecompton, Kansas. Andrew H. Reeder, the territorial governor appointed by President Franklin Pierce, rejected the results of the election and held a separate special election for certain regions that were in dispute. The Lecompton legislature, however, ousted the Free-State candidates elected in the second ballots. In the midst of this dispute, the few antislavery candidates in the new legislature stepped down in protest, and Free-Staters formed their own government at Topeka. They claimed to be the legitimate territorial government and selected Charles Robinson as their governor (he would later become the first governor of the new state of Kansas in 1861). Nationally, politicians recognized one territorial government or another based on their own partisan stances. Despite Kansas already having a territorial governor appointed by the president—Andrew Reeder, followed by Wilson Shannon—Robinson was not arrested until the following year after several instigating events. On April 23, 1856, the notorious proslavery sheriff of Douglas County, Samuel Jones, was shot in the back and wounded. Initial reports erroneously reported that Jones had been killed, and Samuel Lecompte, judge for the First District Court of the United States and the namesake of Lecompton, Kansas, issued an indictment for a number of Free-Staters. Several proslavery militia units, including the Douglas County Militia, the Kickapoo Rangers, and the Missouri Platte County Rifles, made the arrests. But Sheriff Jones went one step further and marched 750 men against the Free-State stronghold of Lawrence to confiscate arms and destroy the Free State Hotel and other structures in the First Sack of Lawrence on May 21. In the midst of this chaos, Charles Robinson was arrested in Lexington, Missouri, on May 10, 1856, and indicted for treason. This warrant was issued by Samuel Lecompte, ordering Robinson moved to Lecompton, where he spent the next four months in jail. Meanwhile, the "bleeding" in Kansas peaked. The escalation of violence in the summer of 1856 can be seen on our Border War Timeline and included the Pottawatomie Massacre, the Battle of Black Jack (which some historians consider the first battle of the Civil War), the dispersal of the Topeka legislature by federal soldiers, and the Battle of Osawatomie. Robinson secured his release on September 10, 1856, one day after President Pierce appointed John Geary as the new territorial governor to ease tensions. But as these additional documents make clear, Robinson was still being indicted a year later, and he was finally acquitted of all charges on August 20, 1857. After Robinson's 1856 release, the violence eased for a time, but the dispute between the Free-State and proslavery factions simmered along the Missouri-Kansas border and nationally until finally boiling over with the onset of the Civil War in 1861.